That's the sound I made often today. Blech. Stomach bug or food poisoning? Who knows? So far, Chad doesn't have any symptoms. Hopefully he'll be spared from whatever it was. The misery started at 7:00 AM, and was mostly over by 10:00 PM when I requested a Diet Coke with a slice of lime and five Melba Toast pieces. Despite earlier attempts to rehydrate and refuel, the DC and Melbas were the first things to stay down. A pattern is emerging that I have a cranky wreck day immediately before exhibiting unmistakable illness signs of the stomach variety. It's like my body is saying, "What? I tried to warn you. You should have bought some Saltines yesterday." In my reckless, overachieving youth, I did not sleep much. I had too much to do! Too much studying, too much socializing, too many chores, too many work hours and too many school-sanctioned extracurricular activities left little time for mere biological imperatives such as sleep. I am now paying the piper, or maybe the sandman, for all that missed sleep. In my middle-age, if I don't get at least seven hours of quality shut-eye, I'm a cranky wreck the next day. Today was one of those cranky wreck days. Every little minor chore and annoyance magnified to colossal proportions in my sleep-deprived psyche. I won't bore you with all the gory details. The main made-me-want-to-cry moments involved the toilet (yes, the toilet I thought I fixed months ago, the ONLY toilet in our 1952 house) hissing repeatedly and loudly as air pressure met water somewhere in the tank. When I removed the toilet tank lid to investigate, I watched to floater ball bouncing up and down rhythmically as the water in the toilet tank did its best impression of a wave pool. Clearly the toilet is haunted. I'm not sure whether to call a plumber or an exorcist. I eventually got the toilet to hush by adjusting the floater ball a bit and turning off the water supply to the toilet until it calmed down. Later I turned the water supply back on for the tank. We'll see how long that little tweak keeps to toilet tank ghost at bay. Incidentally, my next house will be brand-spanking-new with two bathrooms and other modern conveniences! Our neighbors' house is for sale. The sign went up in their front yard yesterday. They have been cool neighbors, so we're sad to see them go. We hope more cool people buy the house and move into it. If you ever thought you'd like to live next door to us, here's your chance! We're hoping that the future owner of the house next door occupies the house. We aren't terribly keen on the idea of the house being a rental or of the house being leveled for an oversized duplex to be built in its place. Wish us luck! How Much Longer 'Til We Get There? When Chad and I moved into the 1952 house a little over four years ago, we thought we would be here for five to ten years. We wanted to make the house livable according to our standards and taste. We vowed not to do anything with resale value in mind, but instead to think of what we wanted and/or needed to be comfortable here. Since Chad left his fancy-pants job to start his own business, our budget became a bit more restricted. We won't be "movin' on up (movin' on up) to a DEE-luxe apartment in the sky-hy-hy-hy" anytime in the near future, and definitely not next year. No Brown Building or Nokonah loft for us just yet. We will be very comfortably housed here. Okay, comfortable in many ways except for kitchen activities. We have no automatic dishwasher. We wash and dry our dishes the old-fashioned way: by hand. The cabinets and countertop in the kitchen are not tall enough to fit a standard dishwasher. There's no plumbing or electrical work for a dishwasher. Though some previous owner of the 1952 house put in new tiles and countertop, the cabinets and drawers in the kitchen are original to the 1952 house. These cabinets and drawers have a certain charm, until you realize that each time you open or close a drawer, sawdust rains down on everything in the cabinet below. Tonight, as Chad washed and I dried dishes, I opened a drawer to put away some clean kitchen gadgets, and the drawer-face came off in my hand. We nailed the drawer-face back into place after I quit laughing semi-hysterically. I need to get the construction adhesive out of the shed tomorrow and cement the drawer-face back into place since the nails will only hold it for one or two more openings. The appliances in our kitchen date back to 1989. Sure, they all work. They are all white, thus matching in color, but no two appliances matching in brand or vintage. The microwave has a big crack in the doorframe, which Chad insists is fine, because the inner seal on the microwave door is intact. Nonetheless, I try not to stand anywhere near the microwave when it's running. Safety first! We'll be living here a good while longer than we originally thought we would. I would really, really, really love to have a dishwasher, along with newer, safer, more energy efficient appliances all around. 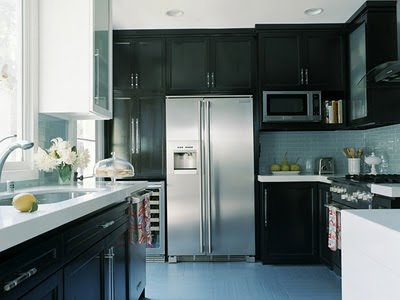 Accommodating a dishwasher would mean new cabinets and drawers, new countertop and backsplash too. In this case, it's necessary to throw the proverbial baby out with the proverbial bathwater, because you don't want to wash dishes in dirty bathwater. If I had a crystal ball, and I could know for certain how much longer we will live in this sweet, old 1952 house, it would help me determine whether or not I want to invest the time, energy, inconvenience and money into remodeling and modernizing the kitchen here. Any closeted psychics out there, feel free to speak up! I peruse the home project websites often, and came across this lovely kitchen designed by Erinn Valencich on the DIY Network's website. The tile backsplash matches the tiles in our bathroom too. I want to go to there. Friend or foe? Or stranger? Or someone with a mild case of road rage? There are lots of motorists honking at, or near, the 1952 house, sometimes at the oddest hours. Sometimes a brief "honk-honk" can be heard from the busy street adjacent to the 1952 house. Chad and I wonder if it might be friends giving a greeting to us or a neighbor. Sometimes a long "haaaaaawwwwwwnnnnkkkk" can be heard, likely expressing disapproval at a fellow motorist on the busy street, or perhaps to say, "woooo... it's 2:15 AM. I should NOT be driving!" Sometimes when I'm out watering the plants at night, a motorist gives a short, sharp "honk!" Usually there are no other cars around when this happens. So I wonder if the motorist just wants to startle me as they barrel by me in the dark, breaking the speed limit, in a vehicle that outweighs me ten to twenty times over. Is it their way of saying, "I could run over you right now if I wanted to! Hahaha."? Recently I signed up to volunteer for Austin Pets Alive! as a "bottle baby" feeder (feeding tiny kittens and monitoring their health). I have to attend some training before I get to cuddle and coddle the tiny kittens, but I'm so happy to be part of this nonprofit. Austin Pets Alive! does lots of fundraisers and materials donation drives. Here's a fun event you can attend this weekend. Who's with me? The chic brunch menu will be served along with $1 mimosas and bellinis while models use the restaurant as a catwalk to showcase Plain Ivey Jane’s top picks for summer. Each guest can choose one of Chef Pellegrini’s mouth-watering brunch creations from Mushroom Risotto to Shrimp Marsala along with fresh fruit and homemade scones and muffins. The brunch will benefit Austin Pets Alive! Bring one item from the APA! Wish List (food, towels, bowls) to receive one free mimosa or bellini. The cost for the brunch is $20 a person plus drinks. Call Sagra at 512-535-5988 for reservations. Saturday morning, I was in the children's section of Half Price Books trying to track down some out of print titles for my nephew's homeschool lesson plans. Fairly deep in concentration between the emailed list of books on my Blackberry and the not exactly alphabetized by author bookshelves, a little girl's face peered up at me and said, "hello," breaking into my vision and attention. "Tomorrow is my birthday," she said. "Oh, cool. Happy Birthday. How old will you be?" "I'll be eight," she said with a certain amount of pride. "Are you going to see fireworks tomorrow night?" I asked. "No. We're going to the bowling alley for two hours with my sister and one of my friends." "That sounds fun. Have a good time." She kept staring at me. I figured I should say something else. "One of my grownup friends has a birthday on the fourth of July too. When she was a little girl, she thought the fireworks were for her birthday. You know, before she learned about Independence Day on the fourth of July." The little girl was unimpressed with this tidbit. "Do you have any children?" she asked. "I have eight nieces and nephews, but I don't have any children of my own. I'm looking for some books for one of my nephews right now." "Nephew... is that a boy or a girl?" she asked. "I go to Brentwood Elementary School. I had to change schools because I got into trouble, and the old school wasn't nice to my parents." "Oh. I had to change schools a few times when I was a kid because my family moved to different places," I said. "Did you like that?" she asked. Honestly, I hated it every single time, but I fibbed a little in my response. "Sometimes I was excited to move to a new school and start over, but sometimes I didn't like it." She thought for a second and said, "That must have been hard for you to make friends and then have to leave. Maybe sad." Oh, little one, it made me so sad each and every time. I nodded at her. Then she reached down to a low bookshelf and plucked out a prize. "I have this book. I like it. Maybe your nephew would like it." She smiled up at me as she displayed the cover for Walter the Farting Dog. I smiled, and fought the urge to pet the little girl's head.